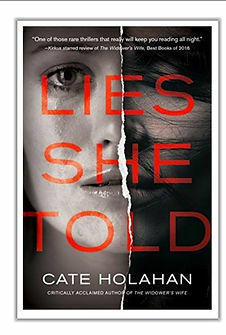 Completely captivating, LIES SHE TOLD receives a 5 star rating on the old Twister Richter Scale! A book within a book that is actually believable (no shape-shifting or body-snatching! ), twisty and mind-bending. Our main character, Liza Cole, is a romance/suspense writer. She has been in a writing slump for several months due to fertility issues and her husband’s distraction about his missing business partner. Liza’s protagonist in her current book, a similarly aged woman, Beth, could be described as Liza’s alter ego, she is a completely fictional character. But, real in the sense that she is in Liza’s book and in her constant thoughts. Got all that? The lines start getting a little blurry, then they get a lot blurry. Don’t worry, Cate Holahan (the REAL author of this book) has expertly written a parallel story universe that exists between Liza and Beth. You have to stay on your tippy toes to keep up with this story, don’t miss any details, everything is a clue! Unreliable narrator? Check. We have not one, but two extremely untrustworthy narrators! Hooray! And those narrators have unreliable characters in their own lives. AAAAAH, who to believe? What’s real, what’s not? This book had me questioning my own sanity until the end when all the clues come together in a believable way. I have never read Cate Holahan before. She is a young author and based on this newest novel of hers, she is going to have a long successful career. She’s brilliant and I want to be in her head again soon! Highly recommended!